ans should watch out for Goeff Eigenmann's hunkier body very soon! 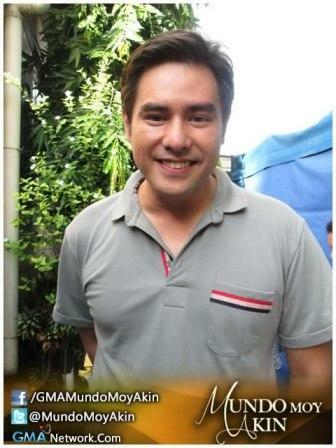 This is what the actor's cousin, Gabby Eigenmann, hinted when he was interviewed by GMANetwork.com on the set of the GMA primetime series "Mundo Mo'y Akin." Gabby revealed that Geoff has been hitting the gym since the first time he took him there. The actor said his cousin is really determined to get back in shape and return to acting soon. It can be recalled that several months ago, there were reports that GMA Network slapped Geoff with a so-called “fat memo” because he had become too stocky for television. Neither Geoff nor GMA confirmed the existence of such memo, however. So, should viewers expect to see Geoff with a six-pack abs in a couple of months? "Hindi naman, siguro mga four-pack abs lang," Gabby quipped. Meanwhile, "Mundo Mo'y Akin" is airing its finale episode tomorrow and Gabby is having mixed emotions about it. Although he feels sad the show has come to an end, he is fulfilled that it ended well and that it was a huge success. "Mundo Mo'y Akin" was extended twice because of its high ratings performance. Gabby said that he will miss the very light working environment on the show, especially their scenes with Ms. Jaclyn Jose, who portrays as Dona Charito. Charito's funny remarks and Jaclyn’s deliberate monotonic delivery of her lines make her co-actors bust into laughter every after take. How the love triangle of Jerome (Alden Richards), Marilyn (Louise delos Reyes) and Darlene (Lauren Young) will end is still a mystery but this mess will be sorted out in tomorrow's finale episode dubbed "the beautiful ending." Beautiful is a positive word. Does this mean that it's going to be a happy ending?